A field goal on the final play gives LSU a 22-21 win. AUBURN, Ala. — Cole Tracy kicked a 42-yard field goal on the final play to give No. 12 LSU a 22-21 victory over No. 7 Auburn on Saturday in their Southeastern Conference opener. 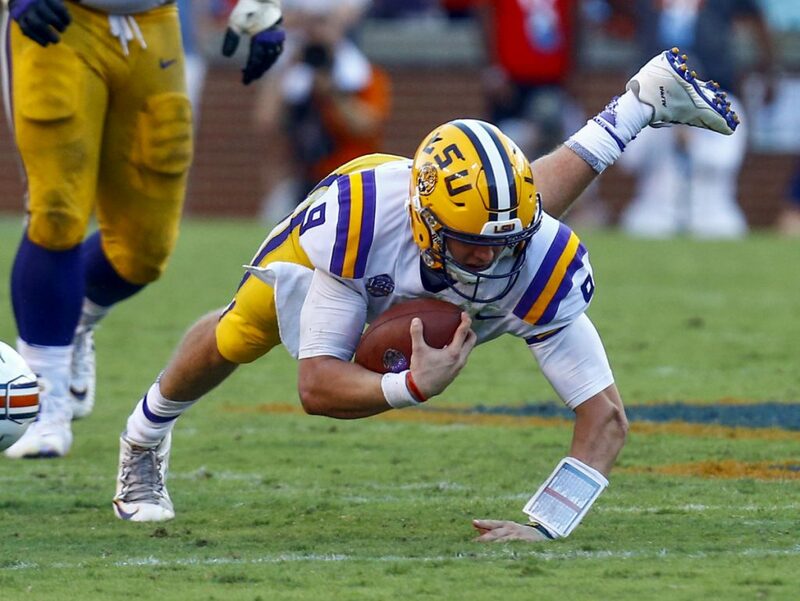 Joe Burrow led LSU (3-0) down the field in the final minutes with clutch plays and two pass interference calls against Auburn (2-1). That set up Tracy’s field goal that sent LSU players swarming onto the field to celebrate. (1) ALABAMA 62, MISSISSIPPI 7: Tua Tagovailoa threw for 191 yards and two touchdowns, Jerry Jeudy caught two scoring passes and Alabama (3-0) buried host Mississippi (2-1) in a Southeastern Conference opener. (2) CLEMSON 38, GEORGIA SOUTHERN 7: Travis Etienne ran for 162 yards and two touchdowns for the Tigers (3-0) and Trevor Lawrence threw for 194 yards, including a 57-yard score to fellow freshman Justyn Ross, in a win over Georgia Southern (2-1) at Clemson, South Carolina. (3) GEORGIA 49, MIDDLE TENNESSEE 7: Jake Fromm threw three touchdown passes and Elijah Holyfield ran for 100 yards, each playing only the first half for host Georgia (3-0) in its rout of the Blue Raiders (1-2). (5) OKLAHOMA 37, IOWA STATE 27: Kyler Murray threw for 348 yards and three touchdowns and Oklahoma (3-0) held off Iowa State (0-2) in a Big 12 opener at Ames, Iowa. BYU 24, (6) WISCONSIN 21: Squally Canada ran for 118 yards and two touchdowns and BYU (2-1) handed mistake-prone Wisconsin (2-1) its first nonconference home loss since 2003, giving the Badgers fits with its motion offense. Wisconsin had one last chance to avoid an upset with a drive that started with 3:55 left at the 8. But normally reliable kicker Rafael Gaglianone’s 42-yard field-goal attempt to tie with 41 seconds left went wide left. (8) NOTRE DAME 22, VANDERBILT 17: Jalen Elliott knocked the ball loose from Vanderbilt receiver Kalija Lipscomb with 1:07 remaining to give Notre Dame (3-0) a fourth-down stop, and the Fighting Irish held on against the Commodores (2-1) at South Bend, Indiana. (9) STANFORD 30, UC DAVIS 10: K.J. Costello overcame a rough start to throw two touchdown passes to JJ Arcega-Whiteside, helping host Stanford (3-0) beat FCS-level UC Davis (2-1). (11) PENN STATE 63, KENT STATE 10: Trace McSorley threw for two touchdowns and ran for three TDs, breaking Penn State’s record for rushing scores by a quarterback with 24, and the Nittany Lions (3-0) beat the Golden Flashes (1-2) at State College, Pennsylvania. (21) MIAMI 49, TOLEDO 24: Malik Rosier threw for two touchdowns and ran for three more to help the Hurricanes (2-1) beat the Rockets (1-1) in Ohio. (24) OKLAHOMA STATE 44, (17) BOISE STATE 21: Taylor Cornelius ran for two touchdowns and passed for another to help the host Cowboys (3-0) beat Boise State (2-1). COLORADO 45, UNH 14: Travon McMillian rushed for 162 yards and two scores and the Buffaloes (3-0) beat New Hampshire (0-3) at Boulder, Colorado. TOWSON 45, VILLANOVA 35: Tom Flacco threw for 320 yards and three touchdowns and Towson (2-1) held on at Villanova (2-1) in a Colonial Athletic Association opener. DELAWARE 27, CORNELL 10: Pat Kehoe threw for one touchdown and ran for another, leading the host Blue Hens (2-1) past Cornell (0-1). CONNECTICUT 56, RHODE ISLAND 49: David Pindell threw for 308 yards and four touchdowns and ran for 137 yards and two more as UConn (1-2) outlasted visiting Rhode Island (2-1).